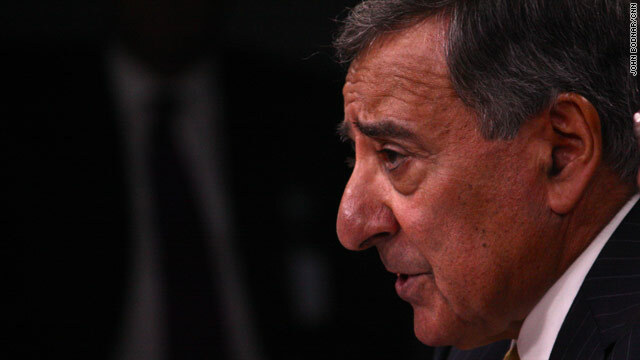 In his final press briefing as defense secretary, Leon Panetta expressed concern over how the world will view the United States if it fails to avert steep budget cuts due to take effect in two weeks. Mandatory budget cuts impacting much of the government, also known as sequester, would kick in on March 1 if no deal is struck between the White House and Congress to avoid, defer or otherwise soften them. For the Pentagon, sequester would mean almost $500 billion in cuts over 10 years. For 2013 alone, some $46 billion in reduced spending would result in "a serious disruption in defense programs and a sharp decline in our military readiness," Panetta said last week. As he prepared to leave Washington for his home in California should his planned successor, former Sen. Chuck Hagel, be confirmed by the Senate later this week, Panetta said other countries are watching to see if the U.S. government can come together and solve the problem. "There is a nervousness out there about whether, in fact, ultimately, we can rise to the challenge of governing ourselves and finding answers to the tough issues we are confronting," Panetta said. "That's why I've said when we talk about national security, I think the greatest concern I have for our national security is that budget uncertainty and that inability to govern and find solutions," Panetta said. Panetta said he was pleased President Barack Obama sought to explain in Tuesday's State of the Union address that budget cuts would have negative consequences on military readiness. "There are jobs that are being lost, there's readiness that has been impacted," Panetta, a former congressman and White House budget director, said. "The uncertainty is hurting people, and it's hurting our country, and members of Congress need to understand that they were elected to protect the public, not to hurt the public. And I hope they'll remember that as they hopefully work towards a resolution of this issue," he added. The military CAN NOT account for BILLIONS of taxpayer money in just Iraq alone. Now they want use scare tactics to force Congress to give them more money to waste. Rearranging budget items so as to have cuts impact vital military services is just a tool they use to hold taxpayers hostage. China's population is 4 times ours. The size of their country is about the same. Our military budget is 5 times higher than theirs. If they can protect the same area and 4 times the number of people for 1/5th the cost, I really have to wonder where the **** our tax money is going. The best part of this story is that it's his LAST press briefing. The country needs Hagel in there ASAP, with an ax. Well stated, NNN. I couldn't agree more! You have got to be kidding me???? Why is the MSM not sufficient? This is how the SECDEF is going to leave his mark??? Shame on him and anyone who supports this. What these UAV pilots and anti-cyber people do, no doubt is a great thing....but to create and award them a medal that is higher than the Bronze Star is a lot of hooy!!! I can tell you that for twenty years all of the cold war veterans, DAV, VFW, worked hard to get the Pentagon to create and award a medal/ribbon to those who served during the cold war. The militaries response then was it cost too much money. Instead they issued them a Certificate for their service during that time. During this current time of downsizing and cost cutting especially, we should not be creating any more medals when we have all we need to recognize these people. I say if a certificate was good for the cold war vets...it's good for the UAV pilots and anti-cyber people!!! Sent into harms way by 4 of the biggest war monger, money grabbers ever Bush, Cheney, Rumsfeld, and their lil'biatch choclate drop Rice. I hate to say this, but I told you so, Sir. You had time to speak against all of these things. You failed. And you failed my sons that served honorably under your command. Let's all forget about what the rest of the world thinks, especially our crony NATO allies and just try to balance the national budget. Let the rest of the world take care of itself for a change! LOL !!! LOL !!! !!! LOL !!! !!! !!! Doesn't take much to pay off muslim monkeys, a camel and a couple of goats is all it will take. Panetta is saying: What they (other countries) worry about is what I worry about, which is whether or not we will be able to make payments to corrupt Islamic governments like Pakistan, Afghanistan, Yemen, Egypt. It's people like you that do not understand and grasp the actual situation. You lie to the public. It's no wonder few Americans fully grasp what is going on. He's reacting to a reality that hit him square in the forehead – as he sees what was told to him would take place by a concerned mother of a soldier that spoke the truth. What you are witnessing is remorse. As a result of his actions – the reality means that one day – he might be called to a trial by an international court for war crimes – so – he didn't listen when he had days remaining to correct what was happening. He is an embarrassment to the United States. This is why he asked the Pope to pray for him in front of the entire international community. And this Pope now retires. They messed up profoundly. Our kids – our soldiers pay for it.